Thanks to Jama at Jama’s Alphabet Soup for hosting the Poetry Friday Roundup today. If you’d like to know more about Poetry Friday, click HERE for an explanation by Renee LaTulippe. Hello Friends! Just In case you haven’t visited before, let me tell you a little about A Great Nephew and A Great Aunt. My great nephew, Landon (now an eighth-grader) and I (his great aunt) collaborate. I write a poem which he illustrates. We started this collaboration in the fall of 2014 and had so much fun with it that we decided to invite others along. Landon and I will continue to have a new episode on one Friday of each month. The other Fridays are filling up quickly with guests sharing poetry and art in beautiful collaborations. I have created a page on my website to view all the episodes of A Great Nephew and a Great Aunt. Click HERE to visit the page and enjoy past episodes. One fun thing that Landon has done in almost all of his drawings is to include a hidden object. It’s the same object every time, so many of you know exactly what to look for. But that doesn’t always make it easy. If you don’t know what Landon’s “special” object is and can seem to find a hidden object at all, you can take a look HERE for hints. And now for today’s collaboration. I’m always delighted and surprised when I see the creative ways that Landon interprets the words in my poem. 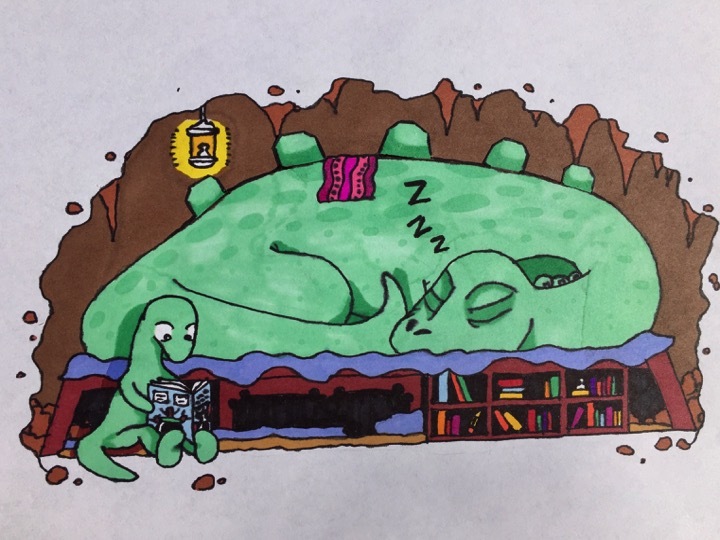 I love that he has little dino reading, while parent dino is sound asleep! By the way, little dino is reading a certain book that’s pretty close to my heart . . . it’s about a dragon 😀 Once again, Landon adds something special! This entry was posted in A Great Nephew & A Great Aunt, Poems and tagged A GREAT Nephew & A GREAT Aunt, art, collaboration, illustration, Landon, Poems, Poetry Friday. Bookmark the permalink. Ah what a delight your poem and Landon’s art are together, his art fits your poem perfectly and then adds more to it! I love his details, looks like there’s a blanket over mama dinosaur and then there’s even a night light, thanks Penny and Landon for this visual and literary treat! Oh, my. That is adorable! Love the poem and LOVE, LOVE, LOVE the illustration. I found the “object” that Landon always includes. So cute. His art just gets better and better. I can’t wait for your first collaboration on a picture book. Thanks, Rosi. I’m glad you loved this collaboration and that you found the object. He’s really good at hiding it well. He just keep growing in talent. I love how you alternate the long line in your poem. It has a good rhythm. Thanks, Brenda. I think it’s a good tool to pace reading. Who knows if it really works 😀 Thanks for coming by! I’ve always loved your parings, and this one is no exception. A talented pair you are! Landon’s artwork is just wonderful. I love the detail he adds to this drawing: the little blanket, the lantern etc. I’m guessing he has a good sense of humor based on his perspective of your poem. I know I had good intentions when reading my children bedtime stories, but often I was the one falling asleep. Your poem makes for a lovely bedtime reading. Such talent!! Great job Landon and Penny. I think a duo picture book just might be in your future. What a fun poem–and incredible drawing. I finally found the hidden object after checking out the clues! Thanks, Kay! And I’m glad you checked out the clues. It was fun coming up with a riddle using Landon’s artwork! Sweet! And I see the special something that’s always in Landon’s drawings. So fun! I loved the poem and Landon’s artwork is amazing!! You two could create some awesome picture books together!! Thanks, Lori. It would be fun to create a book together! Maybe someday! Awesome like always, Landon and Penny. The poem is so cute, what I remember happening when I read as a mom! I found the object, and FYI, saw your books gathered and displayed at the library earlier this week. I should have taken a pic, sorry! Thanks, Linda! Glad you found the object 😀 And thanks for telling me about the display featuring my books. That makes me smile!! Wow–Landon’s art grows more impressive with each edition! Love the twist he added by deciding that little dino was doing the nightly cave reading.